Culinary - Set And Match! Like it or not the parallels between beer and wine are often close, although there are always those who would like to think otherwise. But, historically their aims have often been travelling in the same directions although simply via different routes, one the grain the other the grape. For one in particular however, a new renaissance has been beckoning! One of the age old conundrums with wine was matching it with the correct food at the table. In principle sounds easy enough, yet perhaps because of wines elitist image in the past this became a major source of debate and dictate! Whole books would be devoted to the 'problem' raising it to an academic level worthy of a degree! So strict were the parameters that for the host or hostess to step out of line could spell catastrophe at the table. A raised eyebrow in the wrong direction would speak volumes, worst still, it could become a permanent blot of mismatched incompetence! For wine today the basic guidelines still follow, but there is more flexibility, and importantly 'experimentation'. It is the latter point that has also spelt a change of direction in the world of brewing. Whilst beer would have accompanied food in the past its purpose would have been as an aid to digestion, rather than any 'marrying' of flavours. Only in the last 20 years as more 'speciality' brews have become available has it been seen as a credible alternative to wine at the table. With this in mind regional brewers Wadworth's of Devizes, have developed a range of new brews (made in their micro-brewery) to carry out just such a function, and importantly, have given due consideration to several factors to make these an ideal partner. The range comprises of five beers, each of which would fulfil a role in complimenting a particular dish, but the versatility is there also to use them to support food of similar type to those suggested on the labels. This means that potentially each beer in the range could be used throughout a meal, from aperitif through to digestive/dessert. This is the first time a a brewery has devoted an entire range of beers to the task, and a unique move. The design and packaging too is also well considered. Firstly the bottles are 330ml, always the optimum size especially as several of the beers are nudging over the 5% Alc/vol. level. Larger bottles, when bottled conditioned, have the problem that they need to be served in one pour to appreciate them correctly leaving the yeast sediment behind. Serving such beers at the table with several guests can be difficult, and the Wadworth's brews are all pasteurised which eases the issue. The overall packaging has been stylishly designed, and the information supplied on the front and back labels gives just the right level of detail, not over long or pretentious, but clear as to the brews marrying potential. A nice touch also is the name of the brewer who produced the particular blend appears on the front label, giving it a stamp of individuality. 1. 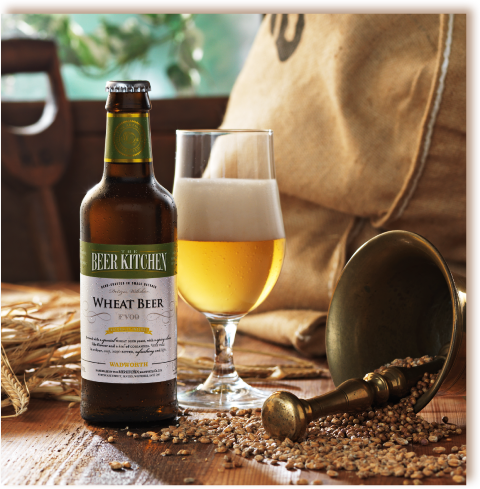 THE BEER KITCHEN WHEAT BEER 5% Alc/vol ( Using Lager malt, Wheat malt and Coriander in the blend) Serving suggestion: White fish or light Salad. 2. 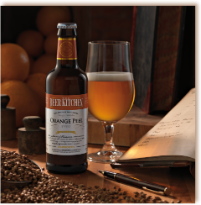 THE BEER KITCHEN ORANGE PEEL 6%Alc/vol (US hops, Munich malt and Orange Peel) Serving suggestion: Complement to Game. 3. 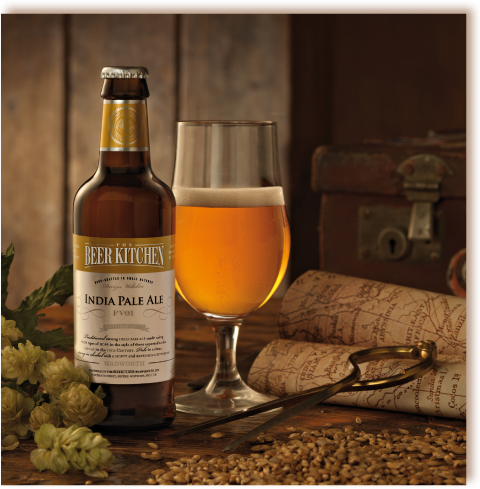 THE BEER KITCHEN INDIA PALE ALE 6.2% Alc/vol. ( Challenger, Target, Citra and Bramling Cross hops used) Serving suggestion: Spicy / Barbecued food. 4. 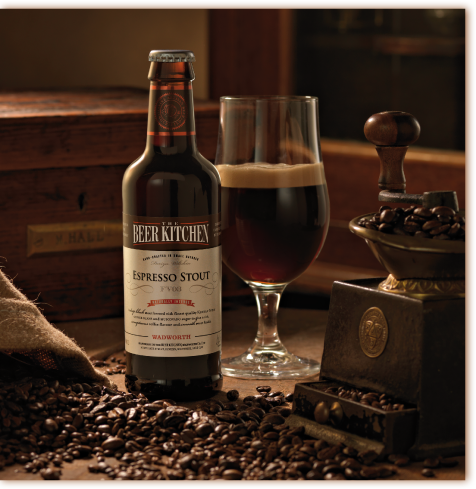 THE BEER KITCHEN ESPRESSO STOUT 5.5%Alc/vol. (Kenyan Nyeri coffee beans and Muscovado sugar) Serving suggestion: Desserts / Coffee. 5. 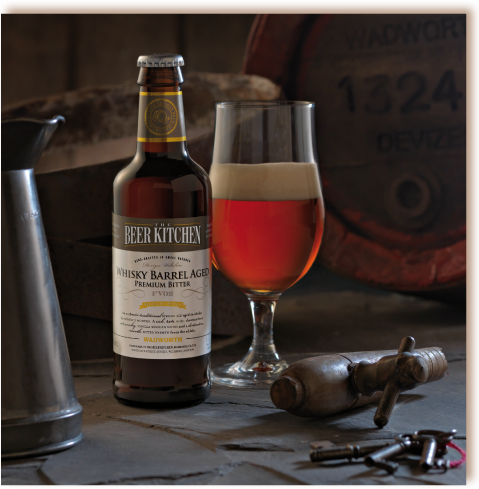 THE BEER KITCHEN WHISKY BARREL 5.8%Alc/vol. (Aged in Whisky barrels for 2 months) Serving suggestion: The Cheese Board. Clearly the team at Wadworth's have put a great deal of thought in to the project and come up with a winning 'combination' - a word particularly suited to this particular range! Let the experimentation begin - and the flavour buds salivate!